Little research has been conducted into the relationship between fashion and psychology, even less on how individuals create wellbeing through appearance and clothing. In this study, the subjective experience of wearing an “outfit that makes you happy” was analyzed using interpretive phenomenological analysis (IPA). Six participants, both male and female, were interviewed wearing an outfit that “made them happy.” The semi-structured interviews highlighted the importance of “intentionally managing identity.” Analysis found subordinate themes: shaping identity, coping strategies, and social identity. These were broken down into “knowing who I am,” “matching my outsides to my insides,” “creating my best self,” “managing moods,” “resilience,” “fashioning positive relationships,” and “shared values,” and linked to the concept of flourishing in positive psychology (PP). The results suggest that how the participants dress plays an active part in their wellbeing through expressing positive emotions, engagement, relationships, meaning, and accomplishment (PERMA). Fashion has been largely ignored by positive psychology (PP); only one paper has been published that addresses the topic explicitly. Masuch and Hefferon’s study looked at dress and PP, connecting fashion to hedonic wellbeing (or “subjective wellbeing”) and eudemonic wellbeing (or “self-actualization,” “meaning making,” and “authenticity”), and considering how experiencing dress in relation to the body, selfhood, and mood improves wellbeing (229). We accept anecdotally that the way we dress can make us happy. However, most literature infers that fashion, as a personal experience and as a system, is problematic; fashion is linked to depression (Howlett et al. ), eating disorders (Trautmann et al. ), narcissism (Larrain and Arrieta), over-dependence on others’ approval (Freeburg and Workman), and loss of autonomy (Hardy et al.). As a cultural influence, it is seen as greed-inducing (Entwistle), environmentally destructive (Allwood et al. 42), and prioritizing profit above individual wellbeing (Beard). According to González and Bovone, contemporary psychology has generally viewed fashion enthusiasts as shallow and frivolous histrionic personality types who pay too much attention to others’ opinions, and obsess unhealthily about creating a fashionable appearance (167). Apart from Masuch and Hefferon, there is no theory to connect fashion and PP. Searches failed to find a study that starts from the premise that fashion is good for our wellbeing. My rationale for undertaking this study is to fill these gaps. But it is also influenced by my positive affiliation with fashion and the relationship I have with my own way of wearing my emotions. The author feels that her own clothing choices positively impact her wellbeing. Photograph. I am aware that the way I dress can create meaning, promote a sense of achievement, and strengthen interpersonal connections (see fig. 1). In this respect, I am intentionally positioning myself subjectively within the research framework; I am also aware that in choosing to use the word fashion rather than dress, or daily clothing, I align myself with the way in which my research participants viewed their style of dressing, as opposed to the academic use of the term. Entwistle describes this as an embodied material system. Hajo and Galinsky reinforce it with a theory of enclothed cognition, where clothes influence the wearer’s psychological processes based on two variables: the meaning we create for particular clothing and the concrete somatic sense that wearing clothing has. Twigg argues that: “Identity and dress are intimately linked. Clothes display, express and shape identity, imbuing it with a directly material reality” (1). This view of dress, and its connection to identity in the context of ever-evolving choice, has been under-researched. Tseëlon questioned the lack of empirical evidence in women’s understanding of themselves through their clothes; when Guy and Banim conducted a grounded-theory study into clothing as a lived experience, they found participants exhibited strong connections between clothing and self-identity. This relationship is an established theme in dress studies. Postmodernism’s focus on the constant options of “being” available to us through the choices we make has been explored by theorists looking at expressiveness, adoption of style, and agency (Finkelstein; Polhemus). The formation of a positive identity through clothing is highlighted in the findings of Masuch and Hefferon, though Clarke and Miller argue that postmodernism’s focus on constant change creates anxiety as much as pleasure. Cushman supports this but offers a contrasting manner of looking at identity, arguing against the positive value of a postmodern position in which a fluid identity is created from an abundance of choice, in that there is problematic dissonance between a desire for a coherent identity-narrative and a dearth of external support to maintain that continuity (599). Thus, the pressure to experience fulfilment through identity merely encourages consumption of fashion, which never reaches the core of that need. From this angle, self-curating identity could be seen as detrimental to wellbeing. Hall and Du Gay consider identity as a way to traverse intrinsic and external need; postmodernity’s focus on choosing identity is again implied to be harmful to wellbeing, as the challenge creates contradictions while individual identity becomes fragmented. In the Masuch and Hefferon study, sameness was considered to be a positive effect of fashion, whereas creating difference as a way to increase wellbeing was not investigated. Previous studies that explore the tension between fitting in and standing out, as negotiated by daily dress practices, have seen this as an approach to alleviating identity crisis and conveying group belonging (Evans; Polhemus). These studies seldom focus on conventional society. In these, the relationship between the body, positive body image, and the way in which participants experienced hedonic pleasure from dressing was considered a key proponent to maintaining wellbeing, as was fashion’s ability to regulate mood. Emotional self-regulation via clothing practices were highlighted as needing further research. Klepp discusses the relationship of clothing choices, comfort, and wellbeing, expressing her worries that we do not currently have the means to analyze what is meant when participants in research studies talk of a garment “feeling right.” Klepp focuses on the link between comfort (feeling) and wellbeing as being a physical sense with little consideration of the emotional aspect of “feeling right” in one’s clothes. Craik advocated that as fashion creates choices, it offers multiple manners in which to perform identity, and this could be considered a manner in which psychological adjustments could be said to be negotiated through dress choices. This is supported by Goffman, who suggests that people in their daily routines organize their dress (amongst other things) to confer a dynamic, unstable impact based on social interactions, an idea that aligns with Bandura’s social cognitive theory (“Human Agency in Social Cognitive Theory” 1175). This model implies that identity happens because of an active conversation between internal and external experiences and constantly changes as the wearer responds to the opinion of an observer, a feedback loop that adjusts clothing choices in response to the needs of identity formation. Additional research proposes that not only does fashion communicate our identities and influence others’ opinions, but that it also affects how we see ourselves, moulding our attitudes and actions (Fredrickson et al. 269; Zimbardo). Building on these themes and seeking to redress the lack of attention given to the relationship between clothing choices, identity, and wellbeing, this study will shed light on how fashion, mediated by identity, positively impacts the happiness of the wearer. In order to achieve the desired understanding around “clothes that make you happy,” IPA, which focuses on the ideographic lived experience of a specific topic (Smith 27, Qualitative Psychology), was selected as the methodology for understanding how individuals feel about wearing a precise outfit at a moment in time. IPA allows the researcher to take an active interpretative role in producing the knowledge that is acquired (Smith, Qualitative Psychology). My position as researcher means I was as much a participant in the study as those interviewed. Aware of my vested interest, the reflexivity encouraged in IPA allowed me to acknowledge bias without it having a detrimental effect on the results. IPA also recognizes that participants are the experts on their experience of the question. The relationship between the author and the participants was deliberately equal, with participants and authors as co-creators of what was discovered (Eatough and Smith 52). The data was procured through six semi-structured interviews with male and female participants aged between 23 and 74. The interviews, lasting between sixty and ninety minutes, were conducted in London, United Kingdom, over two months during the summer of 2016. Ethical approval was obtained from the University of East London. Each participant was given the option of where they would like to meet in order set a tone of equality for the process. Each interview was conducted in person. Dialogue was recorded and transcribed verbatim. Participants were sent information and consent forms prior to the interview. Debrief sheets were provided at the end of each interview. I memorized the interview questions beforehand, but in reality it was only ever the first question that remained constant throughout each interview; to have referred back to set questions would have stifled the conversational tone. Participants were recruited via Facebook. I asked my existing network for volunteers who felt their clothes made them happy to take part in a research study. I had a social connection to one participant; the other five were unknown to me. All participants were linked to fashion through their careers. There was no intention to recruit within the fashion industry and this connection only became apparent once I began conducting the interviews. My interest in obtaining participants was based on the self-acknowledgment of their clothes making them happy; I was lucky to find willing participants who each had a distinctive and idiosyncratic visual identity and who provided me with a variety of perspectives: male and female participants from a wide age range. 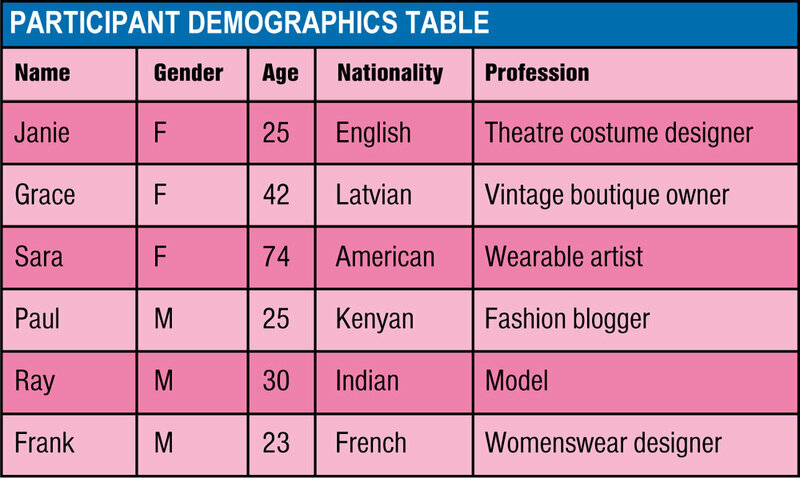 Participant names have been replaced with pseudonyms to maintain anonymity (see table 1). Source: Rebecca Smith and Dr. Julia Yates. The participants were asked to wear, or bring, an outfit that made them happy in order to discuss how this made them feel. The rationale for asking participants to wear a specific outfit was that this would increase a connection to the research question by enhancing the interview and making it a tangible experience. This is supported by Chamberlain et al., who discovered that objects enhanced research interviews, especially the relationship between researcher and participant. The interviews were conversational and informal. I was aware of the influence my choice of clothes was likely to have on participants. Reflecting on how I chose to present myself at each interview furthered my understanding of identity projecting onto clothing decisions, and the impact of the researcher on the study (Frost). It was an unexpected discovery that participants were consciously dressing to create happiness for both themselves and the researcher. All six mentioned my dress and reflected that they had dressed in a manner they thought would generate a happy experience for both of us; they had a desire to make me feel as happy as they were in their “happy outfit.” This made me very aware of my responsibility as researcher and of the effect that generating these conversations was having on how the participants saw themselves.